Need help with your Accounting homework? : P9-2B Urbina Inc. Need help with your Accounting homework? : P9-2B Urbina Inc.
Urbina Inc. is preparing its annual budgets for the year ending December 31, 2014. Accounting assistants furnish the following data. 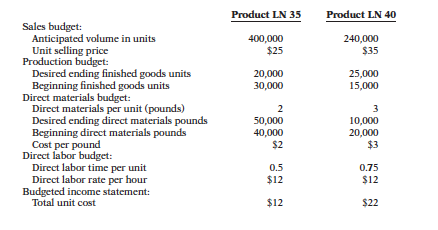 for product LN 35 and $380,000 for product LN 40. Income taxes are expected to be 30%.